Elkhart, Indiana (January 14, 2019)--Agdia, Inc. has commercialized a rapid, user-friendly molecular assay, on their AmplifyRP� XRT+ platform, for the detection of Dickeya spp. 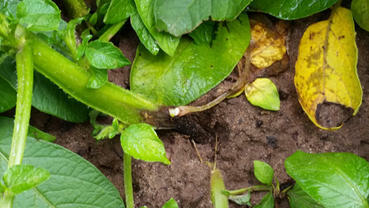 causing blackleg disease on potato. 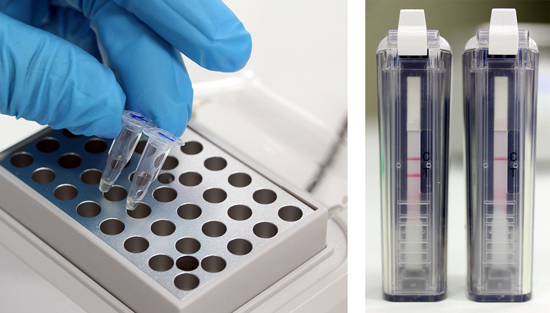 The AmplifyRP� XRT+ assay for detection of Dickeya spp. is an isothermal amplification technology that implements the recombinase polymerase amplification (RPA) platform. This method promotes the rapid amplification and detection of nucleic acid targets (DNA or RNA), via enzymatic reactions, and maintains a single operating temperature of 39oC. The RPA technology provides comparable sensitivity and specificity to polymerase chain reaction (PCR) assays while offering advantages to PCR. Crude plant extracts are processed for RPA and total assay time is approximately 30-40 minutes, including sample preparation. * Results can be visualized in quantitative, real-time format using Agdia�s AmpliFire� portable fluorometer or as end-point detection in an amplicon detection chamber. Furthermore, RPA does not require expertise in molecular diagnostics to perform. 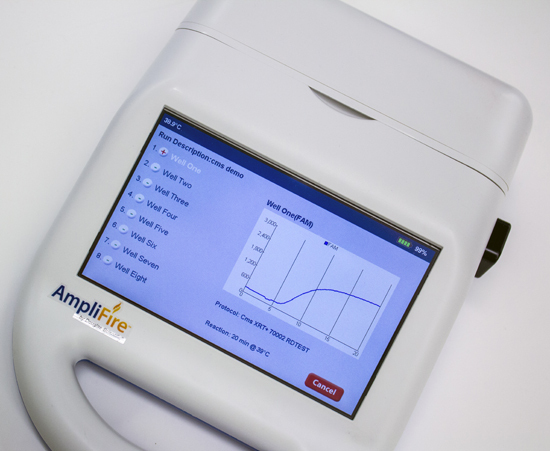 Agdia recommends using the AmpliFire� portable fluorometer (figure 3.) or the amplicon detection chamber (figure 4.) with their AmplifyRP� XRT+ products. The AmpliFire� is battery-operated and portable, allowing it to be implemented in remote locations. A large, intuitive touchscreen makes workflow simple and straightforward while data export options provide for detailed interface with personal computers. The amplicon detection chamber is used in conjunction with a heat block to visualize end-point results. The lateral flow strip inside the chamber detects dual labeled amplicons, both DNA and RNA. Amplicon detection chambers are designed to provide reliable amplicon detection while preventing escape and contamination of future assays. The chambers are for single use only. For more information on Agdia�s complete line of AmplifyRP� assays, please visit Agdia�s website. Figure 3. Results displayed on Agdia AmpliFire�. Figure 4. Results displayed in Agdia amplicon detection chamber. A leading provider of diagnostic solutions for agriculture, Agdia, Inc. has been serving plant breeders, propagators, growers, universities, and private testing laboratories since 1981. 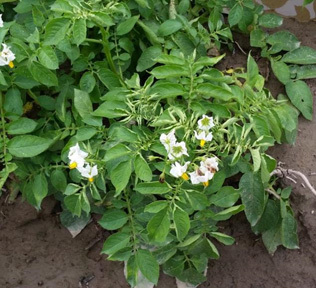 The company offers a comprehensive portfolio of validated, easy-to-use diagnostics for identifying plant pathogens, hormones, and transgenic traits. In addition, Agdia operates an ISO accredited, in-house, testing services laboratory. Agdia�s quality management system is ISO 9001:2015 certified and their Testing Services Laboratory is ISO 17025:2005 accredited. Visit the company�s website at www.agdia.com, e-mail info@agdia.com, phone 1-574-264-2615 (toll-free 800-622-4342) or fax 1-574-264-2153. AmplifyRP� and AmpliFire� are registered trademarks of Agdia, Inc.